Freedom and fulfillment. Two words that define success for Hal Elrod, me and quite possibly many of you, too. Freedom is the external hallmark of success for me. Freedom to choose how I spend my time, my money and my energy. Fulfillment is my internal hallmark of success. I look for and need fulfillment in the work I do. It’s the return on investment that can’t be defined by a number and a dollar sign. 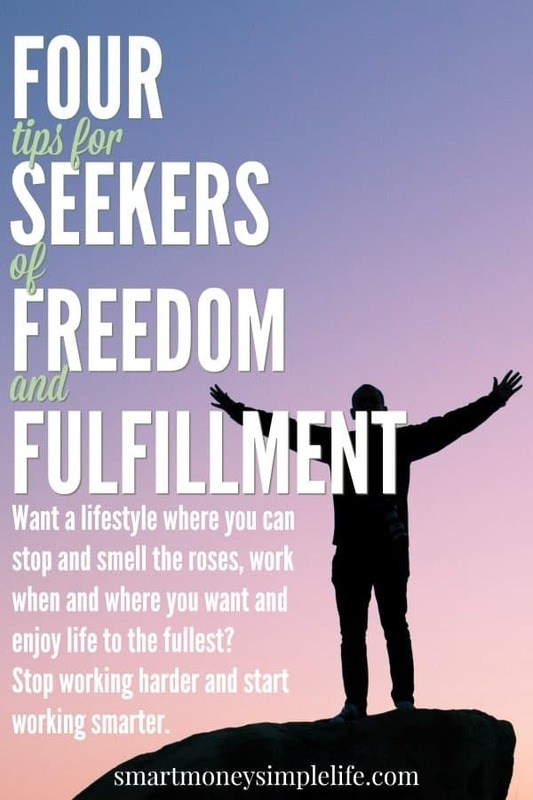 Seeking both freedom and fulfillment have been the motivation behind my commitment to create a business and lifestyle that fit my definition of success and no one else’s. This morning I was lucky enough to stumble onto Hal’s podcast: Freedom and Fulfillment – What I wish I’d known. Hal mentions the three things he wishes he’d known but I think worthiness deserves its own spot in the lineup. What Hal had to say really resonated with me and made me think about my goals in a slightly different way. The information he shared might do the same for you, too. This one might seem obvious but I’ll lay bets you’re not doing it, I know I wasn’t. If you’re looking to create a lifestyle where you can take time to smell the roses, work where and when you want and still enjoy your life to the fullest, then you need to stop working harder and start working smarter. One day, in the not too distant future, I’d like the freedom to be able to choose how I spend my time, money and energy. Some people might call that retirement but I’d rather start living that way well before turning 65. If I’m earning a living by exchanging time for money, that freedom is impossible to achieve. From now on, every decision I make about the future of my business needs to be in tune with that ‘freedom’ goal. Providing one to one coaching services. Owning a business in which others perform the work. When I think about my business and what I should do next, my thoughts now centre on how the next project or task will bring me closer to my goal of freedom. Further reading recommended by Hal Elrod, Scaling Up: How to Build a Meaningful Business… & Enjoy the Ride (by Vernon Harnish) and Traction: Get a Grip on Your Business (by Gino Wickman) are now on my reading list. By changing the way I view the projects I undertake, I’ve begun to actively align all aspects of my work so that each project feeds the next rather than distracting or detracting from it. A great example of this is how I came very close to relaunching my online retail business. I spent a lot of time researching how I’d host it, for example self hosting or via an online eCommerce platform like BigCommerce. I researched new suppliers, website templates, marketing and social media strategies, blog posts… even potential affiliate opportunities that would compliment my offering. Then, I thought about how all that fit in with vision of success: more freedom. The truth is, it didn’t. Spending more time and effort on my retail business might make me more money but it would leave me with a lot less freedom. I spent a lot of time and effort planning the relaunch. And, I dumped it all. Is this project going to help me attain my version of success? Is this project going to compliment my other long term projects? In the end, my answers to all those questions was a resounding, “No”. If you’re considering starting a business, changing jobs or careers or even just starting a side hustle, I recommend you think about your own answers to these questions before you make any big decisions. You might find you need to go back to brainstorming so you can find opportunities that are aligned with your big picture goals – whatever they might be. According to Jim Rohn, each of us is the average of the five people with whom we spend the most time. Spend most of your time with people who only see the worst and feel defeated most of the time and you’ll have to work really hard not to find yourself with the same mindset. You can’t necessarily choose to remove these people from your life but if you’re spending every free moment watching depressing reality TV, you can choose to remove that from your life. Change the channel! If you’re trying to be smart with your money and get out of debt, you need to reduce the time you spend with people for whom shopping or eating out is a hobby. If you’re trying to lose weight, you need to reduce the amount of time you spend with people who think coffee automatically means cake and pressure you to join them. Conversely, if you want to learn how to start and grow a business you need to find and spend time people who’ve already done it. If you want to be happier, spend time with happy people, they’ll show you the way to find happiness in your own life. Spend most of your time with people who see opportunities and you’ll probably see opportunities, too. I’m very lucky to have a close circle of friends and family who are optimistic and enthusiastic. They provide a safe and supportive place to share my dreams and goals. They are my tribe. The internet enables me to expand that circle many times over. There are so many wonderful personalities out there, sharing what they know, that even if you can’t find that positive optimistic influence among the people in your current circle, you can connect to the internet and connect to a wealth of positive influence. Accepting that you are just as worthy of extraordinary success as anyone else out there can be a tough one to get your head around. I know it always has been for me. For as long as I can remember, I’ve struggled with limiting beliefs and their impact on my achievements. And, I’m guessing I’m not the only one who’s built a wall of obstacles between myself and success. It doesn’t take much to extinguish that spark if you’re already battling self-doubt. But guess what? I’m just as worthy of extraordinary success as anyone else. And so are you. What do you need to do now to get to where you want to be in five years? Maybe, just maybe, applying these ideas when mapping out your plan will help get you there, without too many distractions, detours and frustrations along the way. I know I’ll be mindful of each of these tips as I plan my next steps toward the lifestyle of my choosing. How about you? This was so inspiring to me. You have no idea. Thanks for writing it!